I wasn't planning on posting this today but I love it so much! This is Emma's first shoot for VOGUE and she looks GREAT! I really love these photos, they are cute, pretty and fashionable! As you all know I love Emma Watson, she has a personal style that is all her own and she looks gorgeous wearing anything. I am still not totally in love with her new hair, but it's slowly growing on me so I figure I'll love it soon. 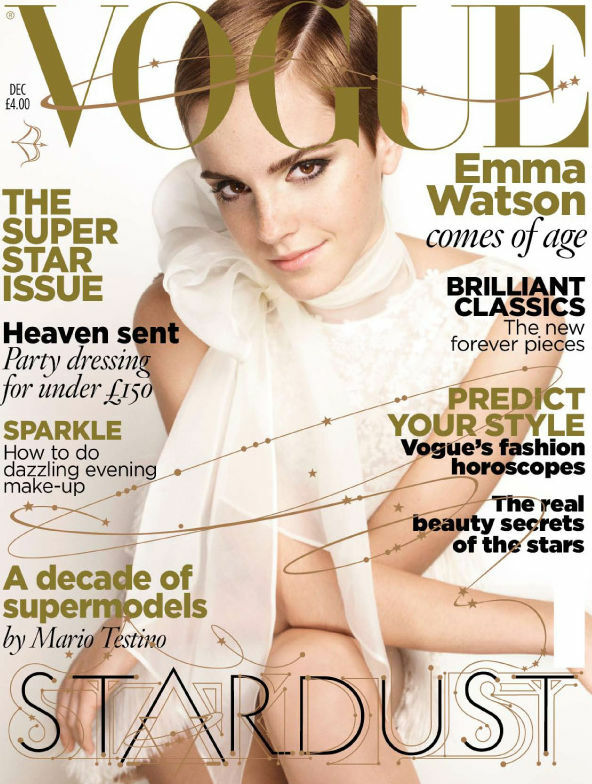 This is the December Issue of VOGUE UK (anyone wanna buy it for me since I'm in the US? ;) ). The shoot was by Mario Testino and I think he did a great job of capturing Emma's spirit in these photos. My love for her just grows :) It's amazing to see her change from being a cute little kid in the early Harry Potter movies to a stunning young woman. I haven't seen her with all of her hair cut off. It looks so great on her. I am hoping to continue to see her in the fashion/movie world. LOve her....and her new hair looks FABULOUS!!! I don't love her new hair but she reminds me of Audrey Hepburn with her hair slicked down. Maybe Twiggy? At the very least Natalie Portman? I can't quite put my finger on it but it makes her look like a completely different (but beautiful) person. She reminds me of Twiggy... I love Emma, she really developed from this little Harry Potter child to a strong and beautiful actress! WOW! She's so graceful ! Looks like Audrey Hepburn with that haircut. yeah--she's basically perfect! i love her. I love her pixie cut so much - she's so talented! I loved her reasoning for cutting her hair, and I think I would have done the same! She looks flawless, as usual. I love her newfound look. I love your blog & am following you now! Could you please check out mine & follow me back if you like? She looks like a young Mia Farrow with her hair like that. Beautiful cover! Oh, I know! These are great photos. I just saw them at The Girl in the Check Scarf. Gah, I love EW! Such a great role model for young (and older, lol) girls. I loive her new short hair cut! makes me wish for short hair again! follow and ill return the favour! She's really gorgeous! She reminds me of Twiggy in these photos. Oh I adore Emma... she's gorg! She is stunning. She so looks like Twiggy. I love her. Absolutely love these pictures! So gorgeous! This hairstyle brings her awesome features into focus. Good move on her part. She'll be the new Twiggy! Yep - a little Twiggy and a lot of cutesy allure. Great post! love her with short hair! cannot wait for the movie to come outtttt!!! I'm on the fence about the hair, but I like the shoot, especially the hat picture. Emma looks so grown up with her hair like that...maybe trying to move on from Harry Potter? The cut is dramatic, but she pulls it of well! and I just adore the light and her makeup in the second shot. wow, she looks a bit like twiggy. beautiful! she looks just like twiggy! i love her edgy hair-cut! I absolutely, positively ADORE this hair on her. I wish I could pull off a similar look, but i have too many goddamn baby hairs and I think they'd have to shave my neck. Not so cute. she's so pretty but i wish she never cut her hair! She looks so sweet and soft. She is beautiful and I love the pixie cut on her makes her look like a little lady not a little girl..
Hi... I just love her hair... it´s beautiful!!!! She is so pretty.. really inspiring photos!! love her short new do... she looks so adorable and even more british... ha! I love these photos of her!!! I LOVE Emma Watson, too. And I know you're a huge Harry Potter fan :) Nov 19 is almost arriving! I hope you're super super excited. And she looks heavenly in that photoshoot - I love her hair cut (I love short haircuts in general, haha), and she just looks more gorgeous everyday. It's almost not fair. I love her. I hate her! haha. her style is so fresh!!! oh, I want to see the new harry potter movie now! That is one stunning, beautiful cover, is it not? Love it! Love her! She has grown into a beautiful and stiylsh woman. Can't wait to see her future acting career. Emma Watson is one of my all-time favorites! She always looks classy and perfect! Btw, your blog looks fabulous! Got any tips for this newbie? Does anyone NOT adore Emma Watson? :).